Childlike faith is simple and uncomplicated, and who doesn't want more of that in their life? Channel this thought with a plain yellow gold cross pendant from Apples of Gold. This simple pendant is a wonderful way to remind yourself of the earnest faith of child with its effortless design. The 14K yellow gold is of the highest quality, so you'll still feel fashionable, too. The plain gold pendant is great way to display your own Christian faith and keep yourself grounded in life's simpler, finer things. 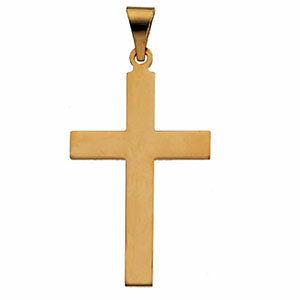 We guarantee our Polished Cross Pendant in 14K Yellow Gold to be high quality, authentic jewelry, as described above.